This is fabulous. The low-hanging mist, the silky smooth water, and the high contrast all work so well together. Instant fav. Instant FAV! This is so strong and yet soft!!!! Beautiful! Love the mist, and the composition with the tree. ok where can i order a print? Awesome on black. Great composition and processing. Obvious Fav. I like the witchy water effect! An enchanted scene. Wonderful composition; it looks so dramatic yet peaceful with the misty effect from the waves. Fav! 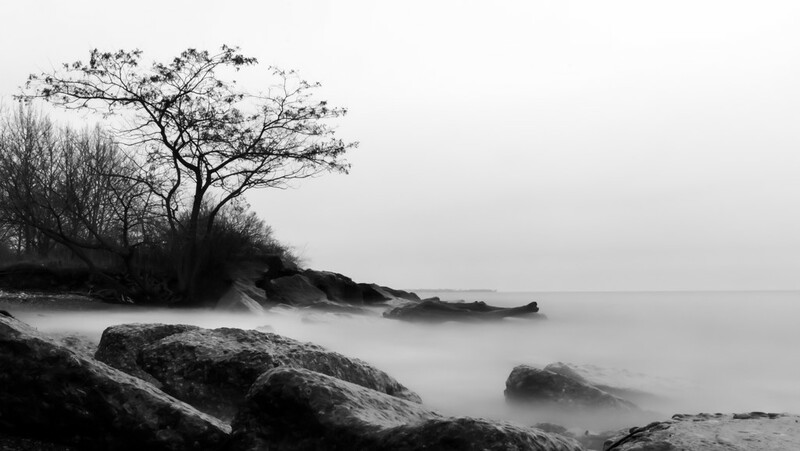 I like the effect the long exposure has with the b&w, gives the shot moodiness. Lovley shot with the B&W giving it a wonderful feeling. fav - it's so gorgeous! Simply lovely. The tree makes it for me. I love this! Beautiful composition and the long exposure works so well here. Great feel to this shot. Congratulations on making TT for the week. Well done.